I went out this year to really try to push my astrophotography skills. I tried all sort of different techniques to figure out which conditions fit my aesthetic. I shot this during a quarter moon, which helped illuminate the flowers while giving nice detail to the milky. 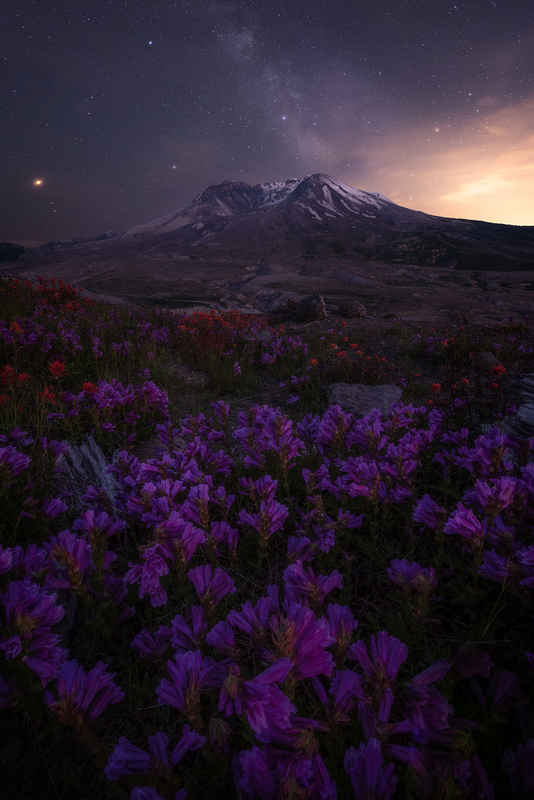 The light pollution to the right of mount st helens is from Portland and Vancouver. I loved how the night lit up from the moon, giving it a very ethereal feel to this gorgeous area. Sir! This is almost cinematic. In my opinion this could not be better. Change NOTHING. I. NEED. THE. EXACT. COORDINATES. THANKS. lol! Honestly I just walked the trails of mount st helens. IT was my first time there! Tons of spots are accessible like this!